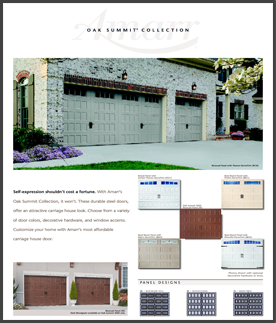 Home > Garage Door Details And Brochures. 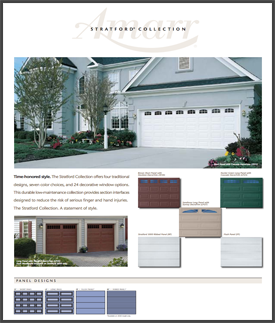 Garage Door, Roll Up Door, Commercial Door Details And Brochures. 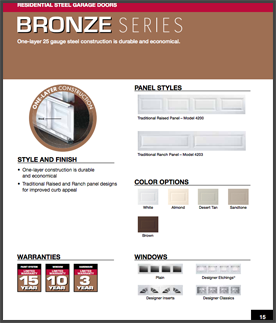 A few things to consider before selecting the perfect door for your home. 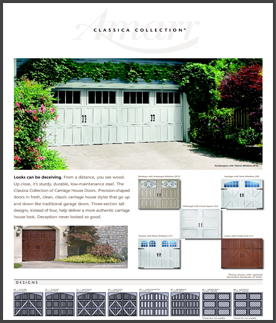 Knowing the basics of a garage door and what your needs are is important before making a purchase. Insulation and the steel gauge of a door is important. 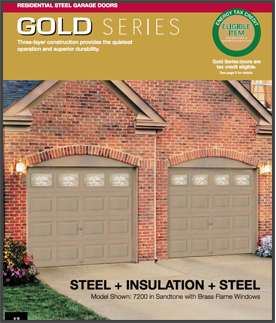 If you plan on spending a lot of time in your garage, have a room above or adjacent to your garage, or have a lot of activity, such as children playing in front of the doors, then you want to consider the R-Value and the thickness of the steel. 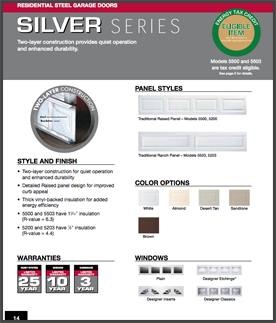 R-Value is a measurement of thermal efficiency of a door. The higher the R-Value the better insulated the door. If there is the chance of basketballs hitting the outside of the door, you need to consider a heavier gauge steel, such as a 24 gauge. Remember, the lower the number, the stronger the steel. 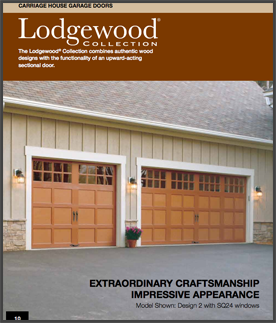 We continue to work hard on all the safety and security features of our garage doors and bring them to market when they're the best they can be. 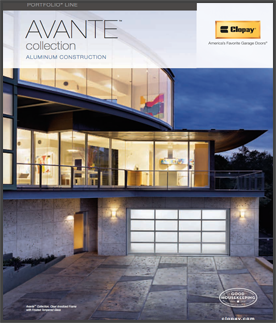 You can count on Clopay to bring you the safest and most reliable doors in the industry. We've engineered safety into our springing systems. 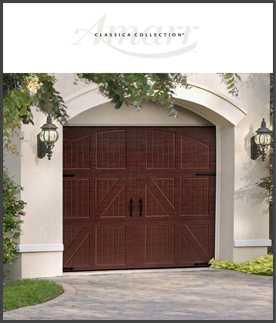 Truth is, very few injuries occur each year resulting directly from garage doors, and we aim to keep it that way. But there are some things you can do right now to further ensure the safety of your family. What does insulation do and why is it important to consider it? 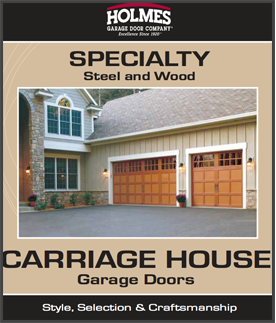 Please use the drawing and instructions below to measure your garage door. 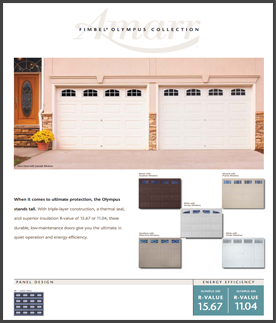 Take these measurements to your local retailer to purchase a garage door. Step #1 Measure door opening width and height in feet and inches. This determines the size of door needed. The rough opening should be the same size as the door. Step #2 Measure for side room: 3-3/4" is required on each side for installation of the vertical track for standard extension spring, standard torsion spring and EZ-SET Torsion Spring System, 5-1/2" for EZ-SET Extension Spring System. Step #3 Measure area labeled �headroom� � distance between the top of the door opening (�jamb header�) and the ceiling (or floor joist). 10" is required for the standard extension spring or EZ-SET Extension Spring System. 12" is required for standard torsion spring and EZ-SET Torsion Spring System. If you have restricted headroom, special hardware is available. 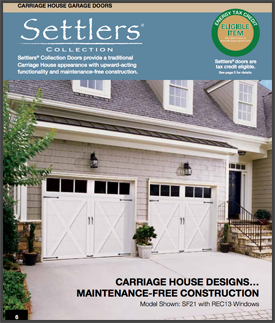 Additional headroom is required for installation of an automatic garage door opener. NOTE: If door height extends above the opening, the headroom measurement should be adjusted proportionately. Step #4 Measure area labeled �backroom� � distance is measured from the garage door opening toward the back wall of the garage. Door height plus 18" is required. Additional back room may be required for installation of an automatic garage door opener. 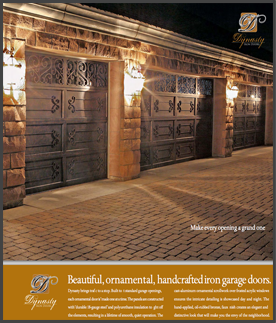 Clopay is committed to manufacturing and installing garage doors that enhance the beauty, safety and value of your home and doing so in a way that reduces the overall impact on the environment in every step of the process - from product design to manufacturing to distribution. We are doing our part so you can do your part to help make your home green! 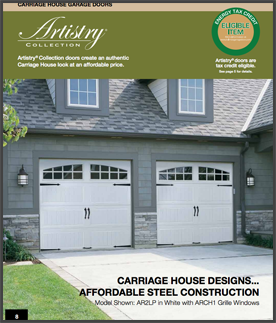 As the largest moving part on your home, your garage door plays an important part in maintaing it's structural integrity and energy efficiency - two important criteria in green building design. 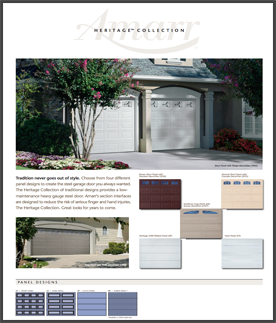 Our residential garage door products are grouped into the four categories below. Within each category choose the specific model number you wish to view information on. The links download PDF files of the specific model you have chosen. Adobe Acrobat Reader 5.0 or better is required. To download Adobe Acrobat Reader click the banner below.